What is ERA in baseball? 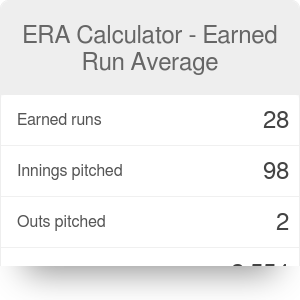 If you're a baseball fan, this ERA calculator might be right up your alley. It finds the value of the Earned Run Average - a metric that measures the effectiveness of a pitcher in a much more accurate way than a simple win-to-lose ratio. Read on to learn the principles of this statistic - what is ERA in baseball, and how to calculate the ERA of an arbitrary player. Moreover, in the article below you can find a brief summary of baseball history, a description of the most iconic baseball organization - Major League Baseball, and some technical information about a baseball field and a baseball bat. Finally, you'll have a chance to take a look at MLB ERA leaders of the last 10 years. To put it simply, it is a measure of a pitcher's effectiveness. It puts his game in the perspective of all nine innings but takes into account the time he has been pitching. By definition, it is the mean of earned runs given up by a pitcher per the total of innings pitched (9 for a regular game, 7 for softball, and 6 or 7 for little league games). If there are any defensive errors happening in the game, the run is considered unearned and is not taken into account for ERA calculations. Generally, the lower the ERA score, the better. The lowest career earned run average in history is 1.82, held by Ed Walsh, who played from 1904 to 1917. After the change of rules post-1920, the highest career ERA score (2.21) belongs to Mariano Rivera, who played baseball in years 1995–2013. Earned runs is the number of runs scored while the pitcher is on the mound. As mentioned before, a defensive error leads to an unearned run. Innings pitched is each full inning (3 outs) that the pitcher has been on the mound. For partial innings, each out pitched counts as 1/3 of an inning. Game innings: typically, this value is equal to 9. It can be lower for softball games or little league games. You can change this parameter in the advanced mode. Calculate the number of innings pitched, considering each out as a third of a full inning. In this case, innings pitched = 65 + 2/3 = 65.67. Write down the number of innings per game. Let's assume game innings = 9. The ERA score of this pitcher is equal to 2.06. Baseball has its own unique and incontestable place in the hearts of American people - more than any other sport. Watching baseball games can give you a massive amount of positive emotions like wonder, euphoria, and pride. They are very common for any baseball fan. This game has a democratic character, it can be played by any person of an average height and weight (unlike basketball, for example). Thanks to all these characteristics, it is so popular in the U.S. that it has become the national pastime. It is believed that baseball has its roots in the British game of rounders. It is also closely related to cricket, because of two teams playing alternately both offense and defense, throwing a ball, using a 'bat' and running into a 'base'. The first documented baseball game leads to the year 1838, but first notes refer to the late 1700s. In 1845, first baseball rules come out for the club Knickerbockers; the author of those was Alexander Joy Cartwright, who is known as 'the father of baseball'. 1869 is the year of forming the first professional team - the Cincinnati Red Stockings. Thanks to them, at the end of the century, baseball became the national pastime in the US (already mentioned above). A few years later, the first modern World Series was founded, and the major leagues were formed: in 1876 the National League, and in 1903 the American League. Baseball had its golden years in the early years of 20th century. In that time, many large stadiums were built for larger clubs (e.g., Fenway Park in Boston or Ebbets Field in Brooklyn). The year 1920 brought a new baseball era with a major change in rules (i.a. introduction of the power hitter). Major League Baseball (commonly known as MLB) is the name of the baseball organization, one of the four oldest, major and professional sports leagues in the U.S. and Canada. Two leagues (already mentioned above) are associated within MLB - National League (NL) and American League (AL), and each of these is divided into three divisions. 30 teams play in the Major League Baseball, 15 in each league (NL and AL). The word 'major' in the organization name means the highest range in professional baseball. Currently, only two leagues: National and American have the status of a 'major league'. In theory, it is possible to create the next major league. In reality, though, it would be problematic to find enough new clubs on the same organizational and (especially) financial level as the clubs from NL and AL. The last attempt of creating the third league in MLB was in the 1950s. Finally, the creation of the Continental League failed. Professional leagues which are not affiliated with MLB are members of Minor League Baseball. Because of its characteristic shape (quite extraordinary, unlike e.g. football or rugby pitches) baseball fields are also known and called the 'baseball diamonds'. Across the Major League, not all ballparks are precisely the same, but a few specific parameters must be met and fit strictly within a prescribed range. The infield must be a square, with 90-feet sides. The area between the two foul lines formed by extending two sides of said square is called an outfield. Construction of a field must be suited to have all the bases at the same level as the home plate. The minimum distance between home plate and the nearest fence, stand or other obstruction on the left/right field foul lines should be equal to 325 feet. 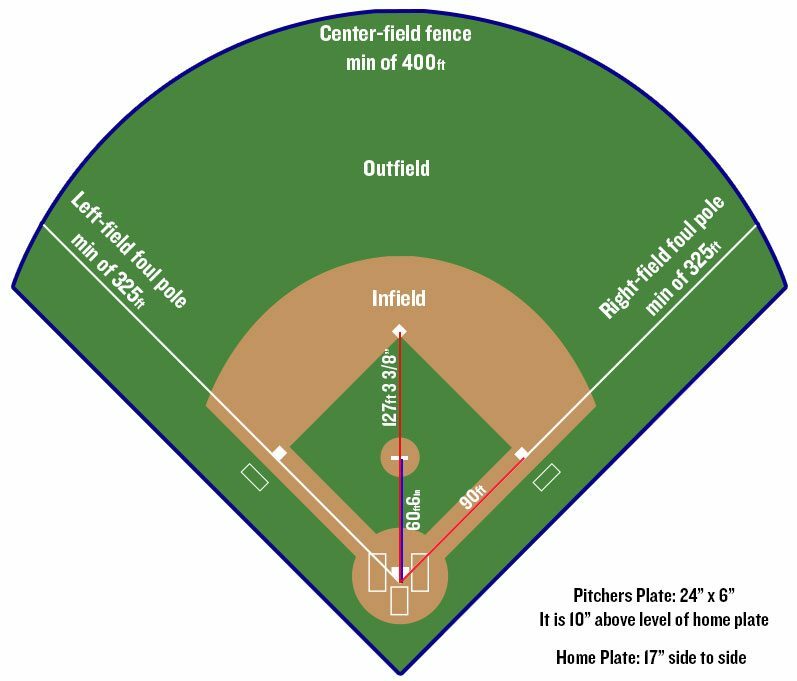 The minimum distance from the home plate to the nearest fence, stand or other obstruction in the center field should have at least 400 feet. The pitchers plate should be a whitened rubber slab with dimensions 24 inches by 6 inches, 10 inches above the level of home plate with the 6 inches away from the back point of the home plate. It is placed 18 inches behind the center of the mound. The mound is within the 18-foot diameter circle and surrounded by a level area that is 5 feet by 34 inches. The slope of pitcher's mound decreases 1 inch per every foot (for 6 feet in the direction of home plate), starting from 6 inches in front of the pitcher's plate. Home plate is a 17 inches square, covered with whitened rubber. Its two corners are removed, so that one edge is 17 inches, a pair of adjacent sides are 8.5 inches each, and the remaining two are 12 inches each, set with an angle to create a point. The 17 inches edge faces the pitchers plate, and 12 inches edges coincide the first and the third base lines. The back tip of the home plate must be 127 feet, 3 and 3/8 inches away from second base. The remain bases are filled with soft material and must be 15 inches squares, with the thickness ranging from 3 to 5 inches. White canvas (or rubber) covers the bases. The baseball rules provide some limitations regarding bats for professional play. Modern bats should have lengths up to 42 inches (107 cm), and the diameter up to 2.75 inches (7 cm). There are no restrictions for weight. The bat should be made of wood, without any kind of reinforcement (e.g., steel) inserted into its center. The same raw materials have been used for years for building the baseball bats. Traditionally, ash trees with origin from Pennsylvania and New York state are considered the best material for bats. The ash wood is lightweight, strong, and flexible, for what it is valued as a raw material. The best trees grow in dense clusters, what provides protection against wind and allows them to grow straight up towards the sunlight. 40-50 years of tree growth is required to bring an ash tree to the preferred 14-16 inches (36-41 cm) trunk diameter. Making about 60 bats from each ash tree is then perfectly possible. As mentioned above, there are two players with the best career ERA-score in history: Ed Walsh (1.82) and, after the change in rules, Mariano Rivera (2.21). Major League Baseball recognizes players seasonally with the lowest earned run average (separately in each league). Let's take a look at the best seasonal ERA players for the last 10 years. As you can see, baseball is a unique sport that touches millions of American hearts and somehow has become a part of American identity. Baseball players are well-known national celebrities and professional sportsmen. They need to train regularly, exercise a lot, keep an ideal weight and diet (strictly prescribed amount of proteins, carbohydrates etc.) to be fit throughout the whole season. That is how the life of a professional sportsman looks like. However, playing baseball on your own, as an amateur, will also give you many benefits. Besides all the strong emotions and fun from competition, this activity could be a good way to exercise, take care of your daily calorie intake or maintain a healthy level of body fat. ERA Calculator (Earned Run Average) can be embedded on your website to enrich the content you wrote and make it easier for your visitors to understand your message.